Queen Emma’s gift to the Bishop Museum, 1885. Queen Emma travelling abroad a hundred and fifty years ago, 1866. St. Andrew’s, the early days, 1909. A few weeks ago the old St. Andrew’s Pro-Cathedral was sold to a Chinese, torn down, and the old lumber used in the erection of quarters for Orientals. It was built in 1866, on land which Kamehameha IV and Queen Emma had given to the Anglican Church in April 1863. The adjoining building of St. Andrew’s Priory was erected in 1867. Services were held in Hawaiian at 9:30 a. m. and 4:00 p. m. on Sunday and in English at 11:00 a. m. and 7:30 p. m.
Queen Emma was a regular attendant and Kalakaua acted as interpreter of the sermon. He was sometimes relieved by Hiram, the husband of Poomaikelani, who was at that time a sort of steward to Queen Emma. Among the regular attendants were Theo. H. Davies, Henry May, Daniel Smith, Thomas Brown (the father of the late Mrs. Alex. McKintosh), Judge Robertson, the McKibben family, Capt. Luce, T. R. Walker and Tom May. The last three were in the Choir. In 1869, Alex. Mackintosh, not then ordained, and the late A. L. T. Atkinson came to Honolulu, and Mr. Atkinson acted as organist for many years. When Bishop Staley left in 1870, Mr. Mackintosh came from Lahaina and took charge of the native congregation, which consisted largely of the friends and followers of Queen Emma. When Kalakaua was elected in 1874, and some of the Queen Emma faction were in jail, word was sent to Nahaolelua that an attempt was to be made on the life of the Queen on a certain night at 12 o’clock. She said that she did not believe it and tried to quiet her friends, but they insisted that the Queen should leave her house on the corner of Beretania and Nuuanu and go to St. Andrew’s Priory and stay with Sister Bertha for the night. Word was sent to Mr. Wodehouse, the British Commissioner, who went to the King and told him of the report. Queen Emma went to the Priory and passed the night in the parlor still standing just inside the gate, and close to the Pro-Cathedral. Under the Pro-Cathedral a number of men hid so as to be ready in case of need. The clergyman, the Rev. Mr. Dunn, in order to appear loyal and a avert suspicion, had the Cathedral grounds decorated with lanterns. The occasion was the return of Kalakaua from a tour of the island, and there was a procession that night in his honor. This is not the only time that a Queen sought refuge in the Priory, but that is another story. Inside the Priory gate a small building still stands. It was attached to the Pro-Cathedral and originally opened into it. Here the Sisters and girls of St. Andrew’s Priory sat during the services, not seen by the congregation but themselves able to see the clergyman and choir. It has been used for seven years as an office for Miss Taggart, treasurer of the Priory. Services were held in the Pro-Cathedral until Christmas, 1886, when the choir of the Cathedral was ready for occupancy, and the old building was given over for general parochial use, including the Sunday School. The fald-stool, the lectern, font and altar-cross now in the Cathedral were all used in the old building until they were moved into the new stone structure in 1886. So were the altar cloths which Queen Emma brought from England. These are now used in the side Chapel of the Cathedral. A portion of the Pro-Cathedral was used for school purposes from time to time. Here a clergyman had a school for white boys. Here St. Peter’s Chinese school was started. 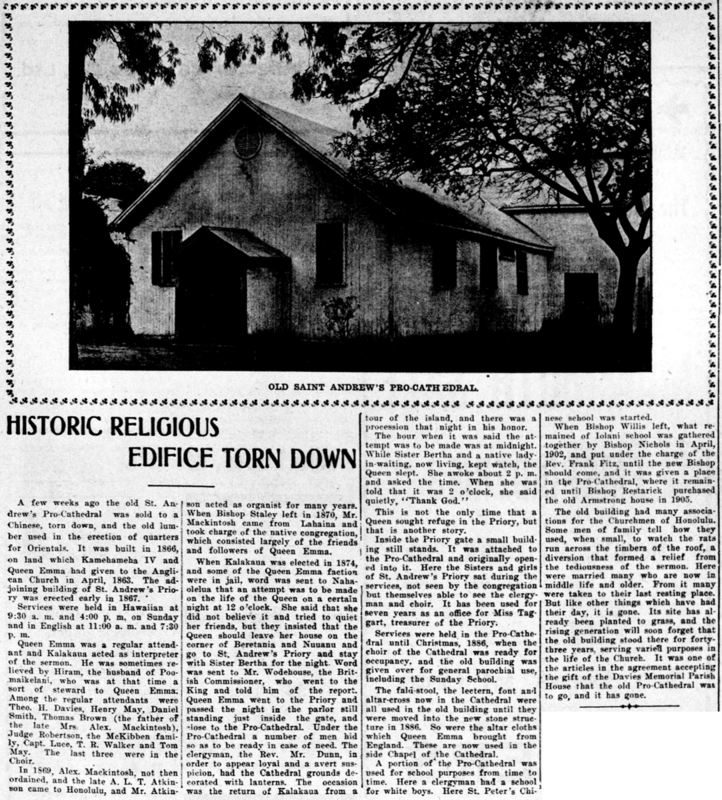 When Bishop Willis left, what remained of Iolani school was gathered together by Bishop Nichols in April, 1902, and put under the charge of the Rev. Frank Fitz, until the new Bishop should come, and it was given a place in the Pro-Cathedral, where it remained until Bishop Restarick purchased the old Armstrong house in 1905. The old building had many associations for the Churchmen of Honolulu. Some men of family tell how they used, when small, to watch the rats run across the timbers of the roof, a diversion that formed a relief from the tediousness of the sermon. Here were married many who are now in middle life and older. From it many were taken to their last resting place. But like other things which have had their day, it is gone. Its site has already been planted to grass, and the rising generation will soon forget that the old building stood there for forty-three years, serving varied purposes in the life of the Church. It was one of the articles in the agreement accepting the gift of the Davies Memorial Parish House that the old Pro-Cathedral was to go, and it has gone. The Pacific Commercial Advertiser, Volume L, Number 8459, Page 3. September 18, 1909. Queen’s Hospital trustees and the Bishop Museum, 1886. DECISION OF QUEEN’S HOSPITAL TRUSTEES. A special meeting of the Board of Trustees of the Queen’s Hospital was held this morning in the Chamber of Commerce room. The object of the meeting was to consider the advisableness and feasibility of transferring the antiquities and curios left to the Hospital by the will of the late Queen Emma to the Hon. Chas. R. Bishop, who is about to open a national museum. Mr. Kunuiakea, one of the heirs of the Queen Emma estate and part claimant of the curios, consents to give his interest in them to Mr. Bishop for the purpose mentioned, on the condition that the Queen’s Hospital also give their interest. 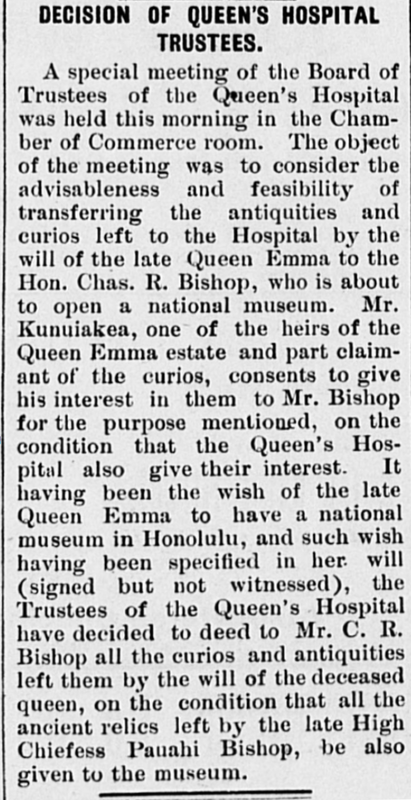 It having been the wish of the late Queen Emma to have a national museum in Honolulu, and such wish having been specified in her will (signed but not witnessed), the Trustees of the Queen’s Hospital have decided to deed to Mr. C. R. Bishop all the curios and antiquities left them by the will of the deceased queen, on the condition that all the ancient relics left by the late High Chiefess Pauahi Bishop, be also given to the museum. The Daily Bulletin, Volume IX, Number 1432, Page 3. September 15, 1886. Beginnings of the Bernice Pauahi Bishop Museum, 1886. E o, e Kaleleonalani! Queen Emma and Kamehameha Schools, 1887. The gates of the Kamehameha School for boys will open in October of this current year. The imperfections of one of the dormitories of 30 x 64 [feet] are almost smoothed out, and another was complete before. These dormitories are two storied, bottom floor and top floor, and each of them have 24 rooms of 8 x 12, and a hallway [keena waena loloa]. One room of each house is furnished with facilities to wash up and clean, and the rest of the rooms are bedrooms, each being supplied with a iron bed, desk, chair, closet, and some other furnishings. The rooms are clean and lighted, and well-furnished for the student. The dining hall of 29 x 81 feet is a separate building, and it is 18 feet from the bottom to the ceiling, and it will fit two-hundred people. A stone building will be built behind this, which will be the kitchen and and a place to store the food and all cookware and dinnerware. A proper schoolhouse will be built after the buildings that are desired to be completed quickly are done, and in the meantime, parts of the dining hall will be set aside as school rooms. A clear spring will supply the school with water and it is by steam pumps that the water will be brought up and filled into a separate water tank, and from there into many pipes laid all over the grounds and buildings. The curriculum at this school teaches thoroughly the branches of the English language; and outside of that are the teaching of industrial arts. Some rooms of the school house will be set aside as rooms for carpentry, printing, tailoring, blacksmithing, and masonry. The instruction will take place under the direction of a mechanic [mekanika]. Some time will also be set aside for military drilling, physical development, and so forth. There are fun and cheerful activities for the students. This school sits on a serene site, living there is pleasant, and it is separated from the town of Honolulu. In a section of this paper, the reader will see the advertisement dealing with this School. This is the educating home established for the benefit of Hawaii’s children who seek education, and built by way of the estate of the late Dowager Queen Ema Kaleleonalani. This home stands in the plain of Kaiwiula in Kalihi, and it is near completion. On the first Tuesday of October 1887, this school will open to students. It has been heard that the assets of the school will be increased for the good of the children, and for now, parents who want their children to progress forward are being urged to rush to this new home where knowledge is increased. Much benefits will be gained if patient and if the aloha of the royal parent Ema Kaleleonalani is held resolute as well by Hawaii’s children, the one who left this great gift behind. Look at its published notice. [On this, the day after Queen Emma’s 177th birthday, i thought it would be a good thing to look back at her role in the establishment of the Kamehameha Schools, a role which she is not recognized often for today. Ka Nupepa Kuokoa, Buke XXVI, Helu 22, Aoao 2. Mei 28, 1887. Another mountain-climbing mele for Emalani, 1871. A mountain-climbing name song for Ema Kaleleonalani. O ke alanui kui lima. He piina la he palaha. E Samaka, e maliu mai. I kapa no ia uka. Ke ala o ka hinahina. [This is another mele honoring Queen Emma and her famous travels through Kauai. It seems the eight lines starting “Haiamu e ka pua” is repeated like a chorus after every two verses. Ke Au Okoa, Buke VI, Helu 43, Aoao 1. Feberuari 9, 1871.